Last year was 2232. I knew this year had to be higher. I had a loose goal of getting to 3000. And while I didn’t achieve that, I feel like I could have if things would have held together in the fall. But with an injury, a real estate purchase, and cooling weather, it didn’t happen. Plus, chasing miles is for suckers. We know that. But a 29% year over year increase in mileage. That’s pretty awesome. Easy pick. I was rounding the corner onto Boyleston Street in Boston. This pictures was taken a block or so later. The crowds got more intense. The noise level was amazing. I could see the finish line. I could see the clock. Nothing could stop it now. It was a perfect race for me. I don’t know if things could come together that well ever again. The descent down Powerline outbound at Leadville. I had run solid until this point but this was our first descent of the day. I had taken a long taper in order to try and heal my injuries. However, the first few steps downhill lit up my hip and told me it wasn’t going to be my day. Less than 20 miles into a 100 mile races, this isn’t a good sign. A close second to this was the ascent up Vickers at the San Juan Solstice 50. I was bonking hard and I wanted to die. I was barely able to walk uphill. I couldn’t breathe. Everything sucked. Usually, my kids steal this one. Running down the street with my at the Leadville Marathon was a classic. This year, they didn’t come to the Leadville 100 on purpose. At Lake City, they weren’t quite in sync. 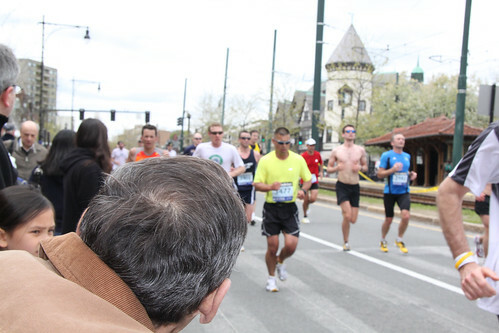 But the moment that stands out the most is when my Dad popped his head out and I saw him at Boston. It was a virtual sea of people. The entire sidewalk deep, both sides, for nearly the entire race. The family wasn’t where they said they would be so I had given up but somehow Herb and I saw each other and that was enough to motivate me on! I trained for this. I am not going to make this bowel problem go away so might as well get better at it. I crapped outside more this year than ever before. I bet there were weeks where I went outside more than I went inside. Swear. I got good at it. So when race time at Leadville came around, it wasn’t a matter of how…it was just when. The first one hit me near the Tabor Boat Ramp. I quickly pulled off trail and went a few steps uphill to get out of the way. I started into my business and looked up. I could see the stream of 800+ headlamps motoring around the lake. It was the coolest thing I have seen in running. Brought a tear to my eye. No picture. You have to see it for yourself. The lights, not the crap. At Leadville. Coming back up Hope Pass inbound. I wasn’t solid coming into the ascent but I was moving. I probably pushed a bit too hard on the powerhikes to start and that was the final straw. I felt dizzy. I convinced JP I needed to sit for a minute. Seconds later, I muttered the infamous “oh no” and with big eyes turned my head off trail and lost a stomach full of fuel. I was way out of it from that point until we summitted Hope and made it to the Hopeless Aid Station. From the biggest bonk comes the biggest recovery. I ran downhill from Hopeless in my strongest effort of the day. Easy. Natalee. JP and I come into May Queen inbound at Leadville. The final aid station. Its been 24 hours on my feet. JP has been with me for 1/2 of that. He is fried. I am too. But I have to go on. So somehow we decide we will swap Natalee in for him here. This was never the plan. But hell, I am walking so she should keep up. Bad news is that she has been on duty the entire day too! We found her, presented the new plan, and within minutes, Natalee and I were on the road headed to the finish line. It would take 4 or so hours to complete this journey but she rallied, coached, motivated, and got me to the finish. We may not talk that often but the experiences that we have shared can’t be duplicated without a lot of effort. There are two ways to do this look back. 1) We can measure based on the goals set for the year when the year started. Or, 2) we can see if I am satisfied now. So method 1, what were the goals? 1. 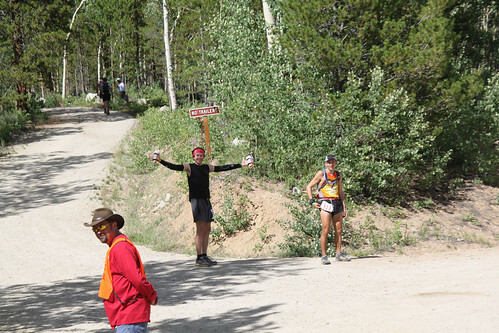 Leadville Trail 100. I achieved the B goal of the small buckle. The A goal was the big buckle. I am proud of myself that I finished my first 100 mile race. I am excited about the possibility of those to come. The race was an amazing experience. 2. 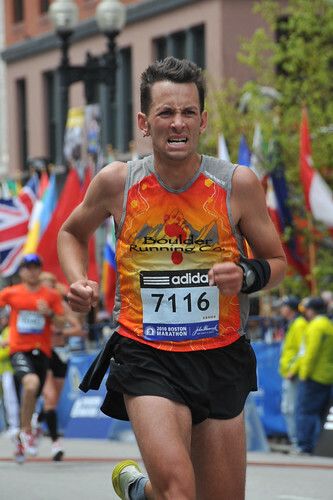 Boston Marathon. I had this as the #2 goal of the year and I achieved the A goal in that race. It was an awesome day and every aspect of the day fell into place. It was the best single race I have ever run — and might ever run. I finished everything I set out to do that day. So that’s pretty good right? B-level and an A-level achieved. And those aren’t two local 5Ks either. Those are “big damn deal” races in totally different aspects of running. I should be happy. In only 5 years, I went from not running a mile to competing into two of the coolest races on the planet. I should be happy, right? But I am not. Its mostly all good, but there is something missing. I wanted just a little more out of this year and that would have been the big buckle. Its not so much the piece of metal itself. Its that on paper, I think I was there. I think many expected me to achieve it. I expected it. I would have bet on it. But things didn’t come together. My body failed me. I figure I had overworked it coming into the race and caused the injury. I tried to rehabilitate it but there wasn’t enough time. So I threw an extreme taper on top of it. All that piled up and didn’t give me the body I needed that day. I like to think that everything else was ready to go. Luckily, I have one thing going for me: stubbornness. I had no desire to quit. And when things kept getting worse, I nearly laughed at it instead of crying. Its been said that Leadville shows you what you are made of. I already knew this feature of myself but got the chance to prove it that day. I like to take that as the reward of the 2010 edition of this race. Plus, it makes for a better story and gives me something to do in 2011. I suppose this is all messed up by the fact that my fall was all about being injured. It wasn’t the “I can’t run” type of injury. It was the nagging kind that wouldn’t go away and limited my efforts. I guess I should be grateful that I was able to continue in any form but it took the energy out of me for the types of things I should be doing. Runs were limited by time and distance because the hurt would start and I knew when. It never got better. It just stayed the same. Time off didn’t fix it. I just got less fit. A double dose of crap. So while the first 1/2 of the year seems great, the 2nd 1/2 is like a blur of nothingness (in the running spectrum). Only a single race. No big efforts. Lots of complaining. As I finish out this year, I am taking a little more time off before embarking on a new year and a more intense recovery strategy. Overall, the best runs of the years are those I shared with friends. I continued to be inspired and energized by the guys I hang out with on the trails and online. Boulder continues to attract the best in the sport and its fun to be playing in the same backyard as all of them. I personally got a lot more recognition from random folks this year at races as well. “Are you Brandon Fuller?” was heard a lot and it was pretty cool to get to meet others that follow my journey as I do the same to others. We all motivate each other in different ways. I didn’t have much to say this fall and I hope that was alright. We all need some time now and then to ourselves. But I hope my voice returns again for next year. While the adventures might not get significantly grander, the fact that they are becoming thought of as ordinary to me is definitely exciting. While year to year, I tend to focus on goals, there are always those other efforts which are more of dreams, than goals. They are the multi-year type of effort. Leadville was that to me. I have told the story here many times before but for the last time(? 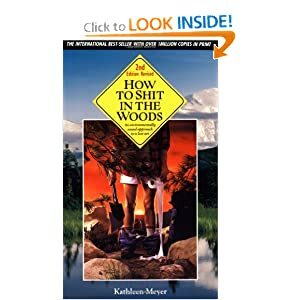 )….we were camping there randomly in 2003 or so and saw them running the race. “How crazy is that?”, or something to that effect I thought to myself. I had never ran a race before. But somehow that day that race entered my psyche. Somehow that formulated into a dream of my own. And this year I am proud to now claim the title of Leadville runner, finisher, and now part-time resident. So while a single goal might not have been knocked out of the park this year, my dreams came true. Hope yours did too.